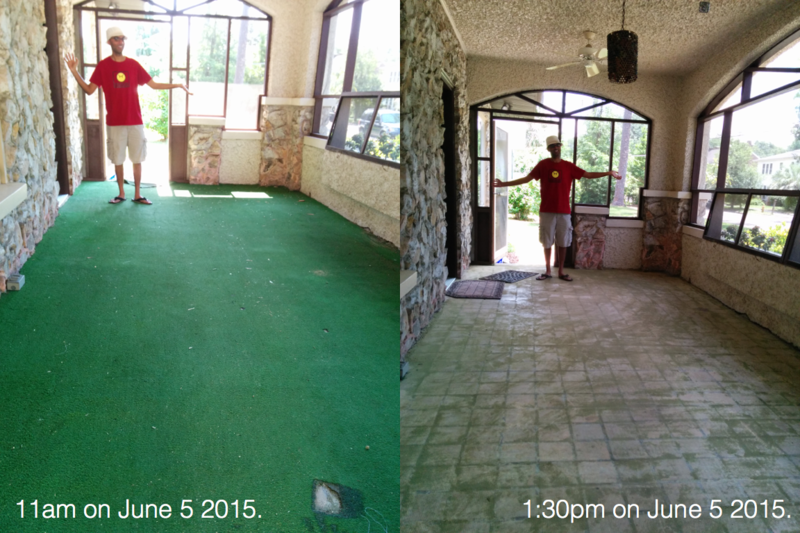 June 2015: While we had professionals working on the flooring inside the house, we decided to tackle the outdoor porch ourselves. The porch was a lovely screened in area, but the floor was covered with ancient, worn out, green artificial turf. We expected that we'd find concrete underneath, and so we searched for what to do with it, how to finish it, the various stains we could get etc. Then we spent a couple of hours pulling it out. It came out quicker than we'd expected (we'd thought we'd have to spend the whole day). We were amateurs about it though, and didn't cut the carpet into strips as we pulled it out, and so we were left struggling with a huge heavy dirty piece with nowhere to dispose of it (more on that later). Amateur luck came to the rescue, and we found clay tile underneath! So we spent the rest of the afternoon with the floor scraper. There's still glue left, but to our eyes, it looks better than the shiniest tile work you can find today.